Come on Ian, we've had three prestige books already this year! Surely EIGHTEEN stamps are enough? Could this be the set that finally persuades hesitant collectors to throw in the towel? Seriously? 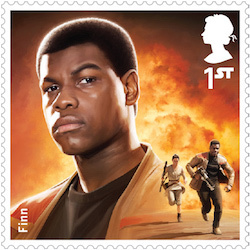 18 stamps for a single American film franchise? 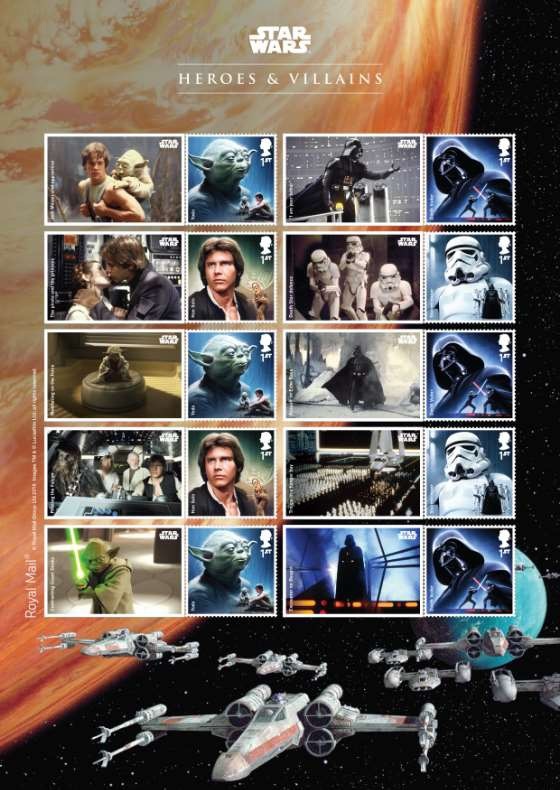 If ever I needed confirmation that I did the right thing by ceasing to collect British stamps, this set is it. It represents nothing but pure greed on the part of Royal Mail. This week has seen an elegant intaglio issue for the longest reign of Queen Elizabeth and now this announcement! Royal Mail has finally turned to the Dark Side. A blatant promotional issue with 12 (!) first class stamps and a mini-sheet with a further eight stamps. The Doctor Who tie-in at least marked a key anniversary. This is just a huge advert for the new film. There is a prestige booklet on the RM website. Due for issue on 17 Dec to coincide with film release. Lots of tat to collect by the looks of it as the licencing rights will have to be milked to get some form of payback. RM is starting to rival the Trucial States!! Are you sure about prestige booklet? I can't see it as a separate item, only as a part of Millenium Falcon Bundle which is bizarre £63. The PSB will be available on 17 December as a separate item priced at just under £17. And the bundles all bring 10% discount on buying the items separately I believe. I stopped collecting GB (everything) because of cost 2 years ago. I really like these so much so that I might start collecting (some) issues again. My son and grand kids will love them and they may just be the thing I have been looking for to get them to take an interest in stamps and collecting. We all have different tastes and reasons for collecting and as ever choice. Purchase is not compulsory so, if you don't like them or the reasons/ethics for issuing them, vote with your feet as I did 2 years ago, and don't buy them.May the Force be with You. As with any issue there are those who will like them and others who don’t. 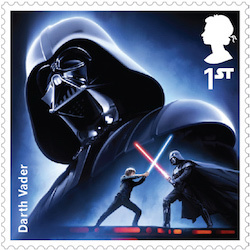 Royal Mail is a commercial business, so the choice of Star Wars is not that surprising given the vast amount of involvement from companies around the UK. Royal Mail will no doubt view this as a money spinner; they have taken a sensible approach in splitting the date of issue of the set/Miniature sheet/Smilers sheet, and the various single value packs which they are advertising on the link above, from that of the Prestige Book by nearly two months. The cynic may say that they have done that for the Christmas sales, and there must be some truth to that. However this like the Doctor Who stamps will have an appeal beyond the philatelic community greater than most issues, and introduce them to the hobby that we have chosen, can you remember the set that sparked your interest? So, they gave up doing Europa this year for the film!? As for collecting - encourage penfriendship and correspondence - without post/snailmail there'd be no new stamps. Some people might think mint stamp collecting is just glorified sticker collecting. 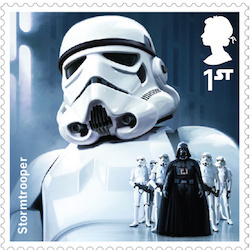 I like the Union Jack stamp included in the Star Wars context. The Empire Strikes Back? Like I say a good many times GB Commemoratives are not worth the paper there printed on. Collect if you like , But for investment purposes not worth it. Commems from years ago used in everyday postage from dealers. Presentation packs split up and gastly fdc's cut up and presented in bundles at stamp fairs. I was tempted to disallow this as too political but having looked again at the picture I concede you have a point! Re the prestige book: if it contains all 18 1st-class stamps plus the mixed definitive pane of 6 x 1st + 2 x 2nd + the usual 95p psb surcharge, that comes to £17.15. RM advertises the book at £16.99 - does this mean they are giving us a discount on the premium to keep the price down under the psychological £17 barrier? Interesting question - I hadn't done the maths. I'll know more tomorrow. This issue is nothing more than a crass attempt to get money from non-collectors. Whatever happened to British stamps commemorating British events? The Doctor Who issue was excessive and clearly aimed at the non-collector - but at least Doctor Who is British. 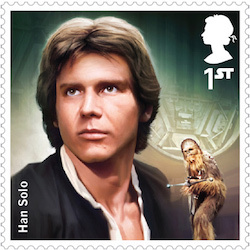 Star Wars is American and should have no place on British stamps. Some of the actors, etc. that are mentioned may be worthy of commemoration - but do so for their entire body of work, not for a set of American films. How is it that Her Majesty is only worthy of one miniature sheet - and this gets a larger miniature sheet and a set of 10 stamps? Thanks for your comment Bill, I'm sure the people at Royal Mail will be interested in comments made despite the clear statement of rationale up there (in italics). Not just the actors - unlike Canada we don't honour them until they are dead - but the whole body of film-making. One of my contacts at Royal Mail read these comments with interest, and remarked how diverse they are from "Royal Mail has finally turned to the Dark Side. A blatant promotional issue " to "I stopped collecting GB because of cost.... I really like these so ... I might start collecting (some) issues again. " Just seen these in the flesh briefly in my local PO as the counter clerk was sorting them out (and of course going into the safe for another 3 weeks). Two sheets of each of the 1st class sheets of 30, plus 1(!) MS. I'd expect them all to go inside the first day and be back to issuing Machins by the day after. I was just perusing the ‘Star Wars’ edition of First, on page 10 there I reference to a limited edition collectors Prestige stamp book in addition to the previously announced one. No doubt something for the pitchfork brigade to get up in arms about, I wonder what surprises this one will hold, now where did I leave my pitchfork. 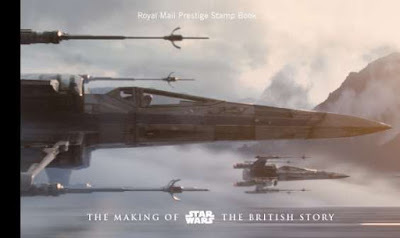 Hopefully there's no chance that the £120 "Prestige Stamp Book - Limited Edition" will include different stamp designs or eg technical differences eg perfs or gum? Not as such, although the miniature sheet stamps are split over 2 panes, so they area very different printing. Otherwise I believe the technical details are all the same. Thanks Ian. Let's hope Lighthouse don't find any reason to include them then!! I think it is interesting that no-one has made a comment about the foreign currency earnings potential of this issue.Call me cynical if you like, but I bet that this aspect has not passed by the Royal Mail bean-counters, and might have had some influence on the choice of subject !